Home » Our Doctors » Marichris Lim, O.D. Dr. Marichris Lim was born in Queens, New York, but grew up in Tampa. She earned a Bachelor of Science degree in Chemistry with a minor in mathematics from Florida State University. She earned her Doctor of Optometry degree from the Pennsylvania College of Optometry at Salus University (PCO) in Philadelphia. Dr. Lim is well-trained in ocular disease and specialty contact lenses. While attending PCO, she successfully completed an advanced studies program in contact lenses. She has completed ocular disease internships at Omni Eye Specialists in Baltimore and Newsom Eye in Tampa. 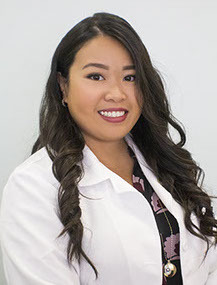 She also completed corneal disease and specialty contact lens internships at Eye & Site Center in Voorhees, New Jersey, The Eye Institute in Philadelphia, and a low vision/vision rehabilitation internship at the Tampa Veteran’s Clinic. In January of 2017, Dr. Lim presented a scientific poster at the Global Specialty Lens Symposium in Las Vegas. Dr. Lim’s commitment to providing high-quality eye care has been recognized through the following awards: Salus University Clinical Excellence in Primary Care, Alcon Case Report Award 2017, Blanchard Excellence in Specialty Contact Lens Award, and the GP Clinical Excellence Award. She is a member of the American Optometric Association and Florida Optometric Association. Dr. Lim is a big college football fan and is a die-hard FSU Seminole (GO NOLES!). She also enjoys watching college basketball and professional football. She travels whenever she gets the opportunity.